Race through Gotham City in pursuit of Man-Bat™ and the Kabuki Twins™ in the Batmobile. 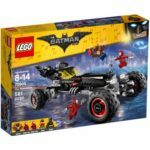 Bring exciting new play possibilities to existing LEGO® sets with the LEGO Minifigures THE LEGO BATMAN MOVIE Series 2 collection. 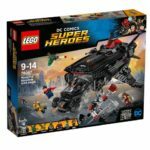 Unleash the Batmobile from The Flying Fox with the LEGO DC Comics Super Heroes Flying Fox: Batmobile Airlift Attack 76087. Join the Justice League mission to defeat Steppenwolf and the Parademons! Pilot The Flying Fox with Cyborg and fire the spring-loaded shooters and stud shooters. 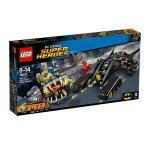 Unleash Batman in his Batmobile and target the Parademons with its stud shooters. Then team up with Wonder Woman and Superman to take down the terrifying Steppenwolf and grab the Mother Box! 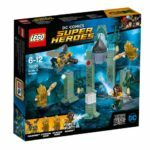 Protect the precious Mother Box from the evil Parademon with the LEGO DC Comics Super Heroes Battle of Atlantis 76085. Emergency! The Parademon is trying to steal the Mother Box. Fend off the evil invader with Aquaman’s Power Blasts and the Atlantean guards’ PlasmaGuns. Block the super-jumping Parademon’s attempts to topple the grand arch and make sure the precious Mother Box stays in Atlantis where it belongs! 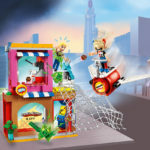 Join in the action-packed LEGO® DC Super Hero Girls™ world as Supergirl™ confronts Lena Luthor™ at the Kryptomite™ factory! 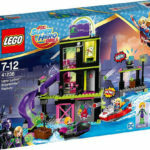 This great set features a 3-level factory with lab, Kryptomite dispenser/slide, crystal element, break-out door, holding cell, rooftop shooter and a ‘power drain’ room, plus Lena Luthor’s getaway boat, Supergirl’s jet boat with dual shooters, Krypto™ and 3 Kryptomite figures. HELP! GREEN KRYPTOMITES HAVE BROKEN INTO THE CAFÉ, LOCKED STEVE TREVOR™ ON THE ROOF AND ARE TRYING TO BREAK INTO THE SAFE! ZOOM IN WITH HARLEY QUINN™ ON HER JET TO SAVE THE DAY. Help Krypto escape from Lashina’s tank LEGO DC Super Hero Girls Lashina Tank. Drat! Supergirl’s phone is on alert; Lashina and the evil little Kryptomite are coming for Krypto! Close the shield on Krypto’s house to stop her stud shooter and then jump up on the roof to fire the catapult. Oh no! Lashina has captured Krypto with her whip and taken him to the cage. The blue Kryptomite gets confused easily, so help Krypto escape from the back of the tank before they take him away! Includes a Lashina mini-doll figure, plus Krypto figure and a confused blue Kryptomite.